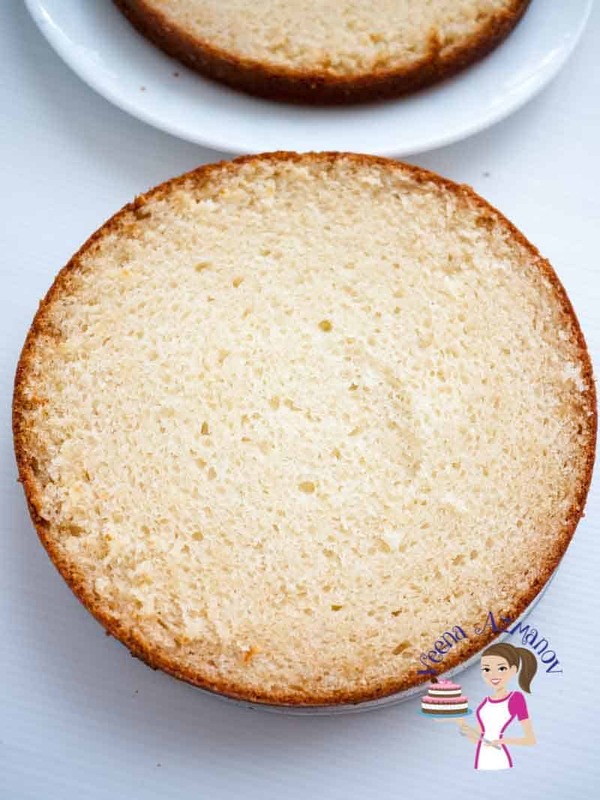 This eggless vanilla cake recipe is moist with a soft crumb. It tastes absolutely delicious on its own with tea or dressed with frosting for an elegant celebration cake. It can also be used to carve into a novelty cake with ease. A simple, easy and effortless recipe that’s versatile and can be tweaked to make many different flavors and combinations. 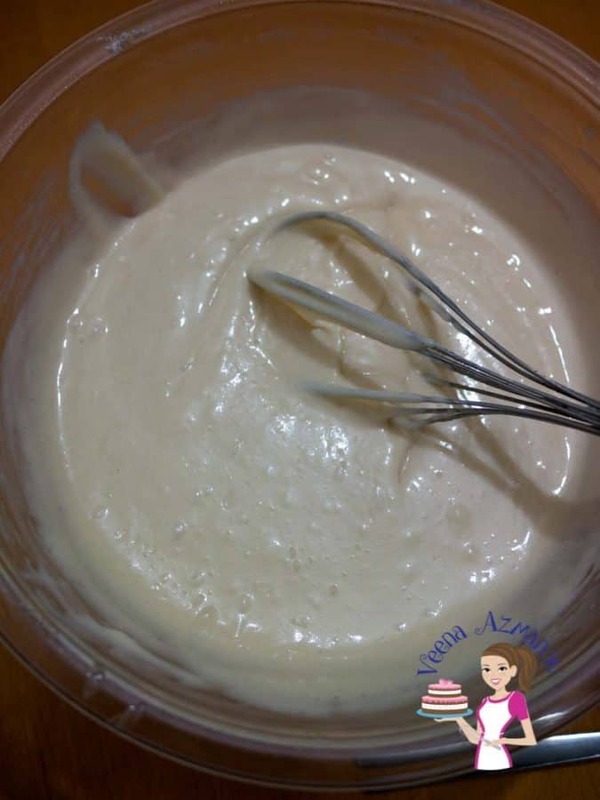 It’s been a while since I perfected this eggless vanilla cake recipe for my customers. I love how moist and tender the crumb is, but mostly how easy it is to make. 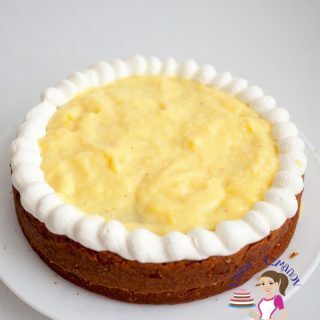 The best part I customize this same recipe to make many different flavors of a Moist Orange cake or lemon cake etc. I will share those with you in the future too. The best part about this cake is that it has a firm texture but a soft crumb. Look at that texture inside and yet it’s soft and delish! 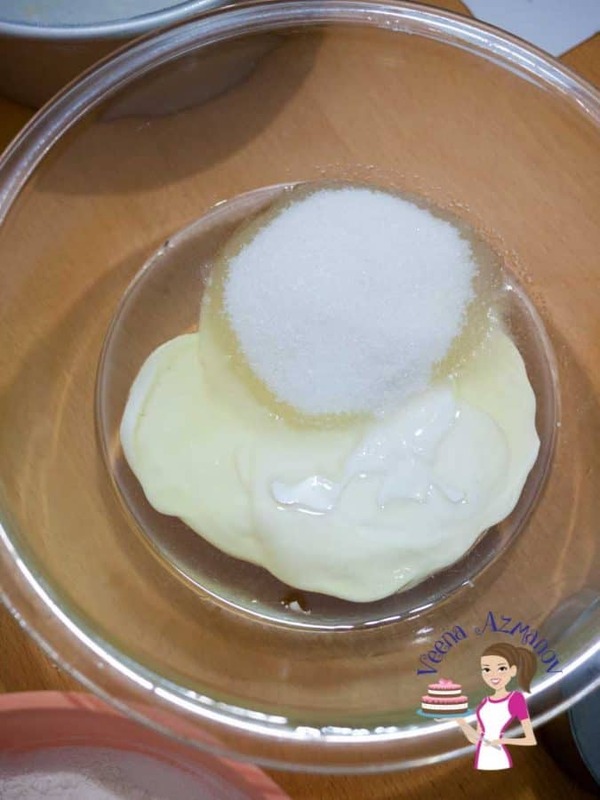 Sugar – It is best to use fine grain white sugar or caster sugar as it melts easily in the mixture. If you don’t have fine grain sugar just pulse the sugar in the food processor to ensure it’s fine and not too coarse. 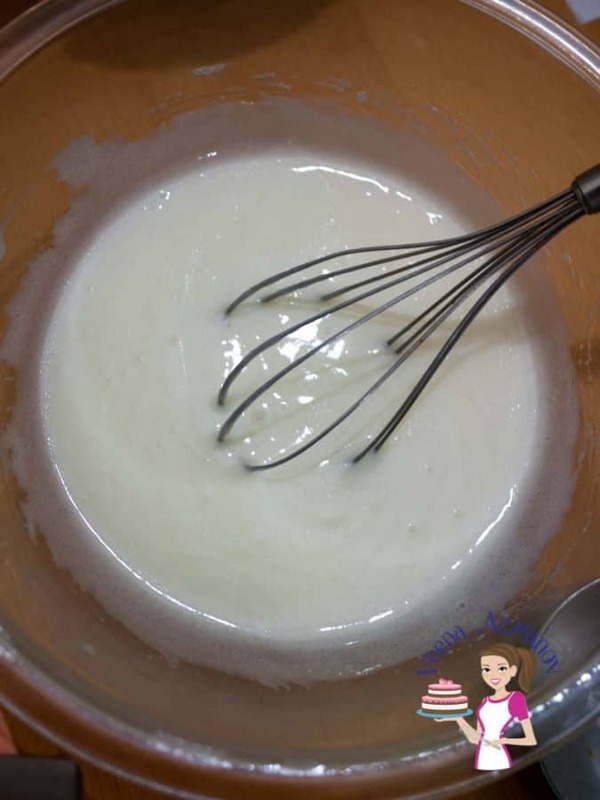 Yogurt -this is actually a substitute for eggs in the recipe so do not substitute with anything else. I used a plain store bought natural yogurt. You can use homemade yogurt as well. Water – You can substitute water with milk, orange juice or buttermilk BUT do ensure that it’s warm, not cold. 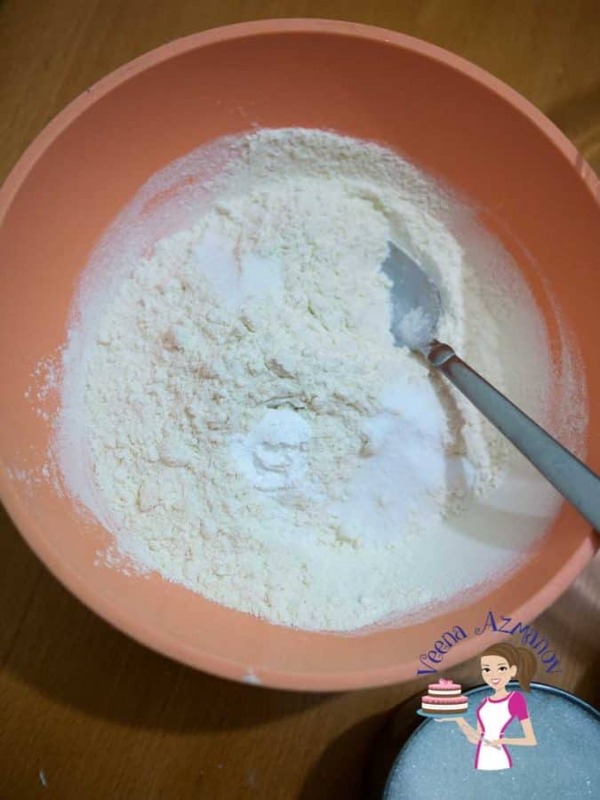 Eggless cake for Cake Decorating. 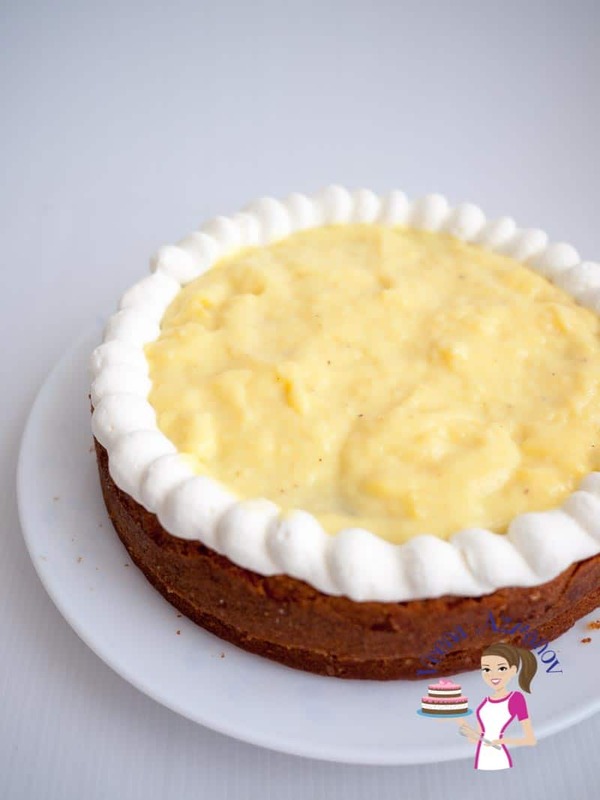 This cake is moist and soft when baked and if I use it fresh with a filling or frosting I do not need any simple syrup. But if I have to use it to decorate a celebration cake I do add a little extra simple syrup to keep it moist. This cake can be used to carve, it can also be used for a tiered cake as well as a base for fondant cake too. The options for filling in this cake are endless!! And I have given you a huge variety of filling and frosting recipes on this blog. 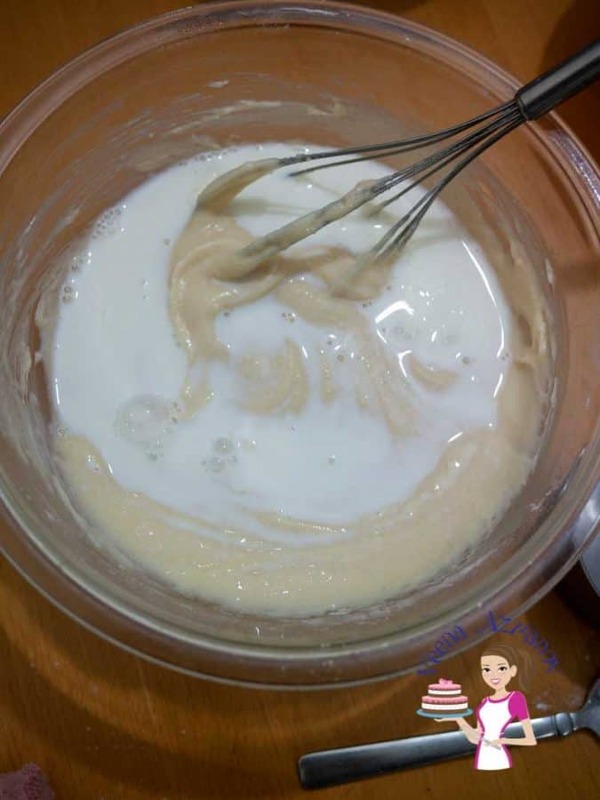 Here I am using Vanilla Pastry Cream but you can use other fillings like eggless vanilla pastry cream, Strawberry Filling, Blueberry Filling, Mango mousse, Chocolate mousse as long as you use a Frosting Dam!! Remember the basics of cake decorating? yes, we need that frosting dam so you won’t have the filling spill out from the sides of the cake. Bake for 30 to 40 minutes until a skewer inserted in the center comes out clean. After 10 minutes invert onto a cooling rack and cool completely before decorating. Often I make my eggless chocolate Fudge cake. I alternate layers of vanilla and chocolate cake with different fillings to create one exotic delicious cake. Sometimes I use Eggless Vanilla Pastry cream or sometimes it’s my eggless chocolate mousse filling. 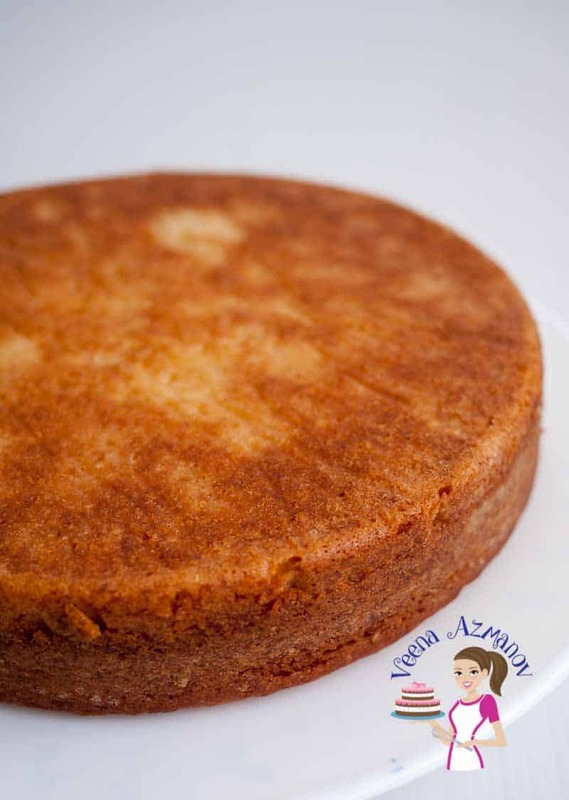 This eggless vanilla cake is moist with a firm texture but soft crumb. It tastes absolutely delicious on its own and can be used to carve into a novelty cake with ease. A versatile cake that can be tweaked to make many different flavors and combinations. 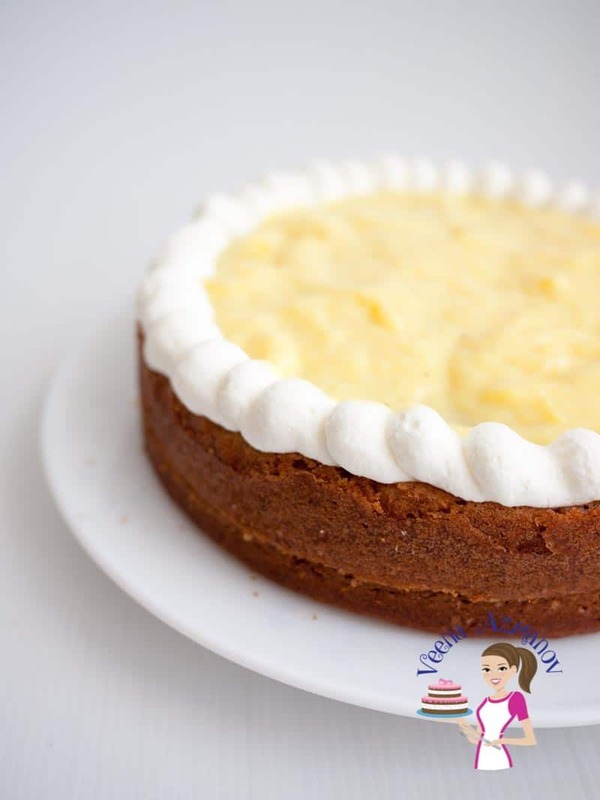 thank you so much to Eggless Vanilla Cake and your blog are very informative for me. Thank you, Ronny. Happy you find my blog useful. Not all my cakes have butter Veer. I have some oil based cakes too. Like the Red velvet cake, the strawberry cake is oil based. As well as the latest pumpkins cakes. You can also make crustless cheesecakes. Thank you for the reply, she was interested in vanilla cakes, it would be great if you can post a recipe for the eggless chocolate cake, that would really be helpful. Looking forward to it. It is on my wishlist Veer and I’m hoping to get thru this list in 2019. Stay tuned. Hi Veena, I’ve been asked to make an eggless 3 tiered wedding cake and have come across your recipe which sounds great. I haven’t made it yet as only discovered your recipe a day ago. Want to know if it freezes well as I usually make cakes a little bit ahead of time and pull them out closer to the day to decorate. Will be making it today to see how it turns out. Just curious if it freezes well. Thank you. I would highly recommend you make it and test the recipe. See if this is what you want and like. I would hate to see you stressed if my recipe didn’t work for you. Now to answer your question – yes, it does freeze well. I kept it up to 2 weeks. I would recommend adding sugar syrup when frosting. Ah, I just read you plan to test it. Great. THank your Veena. My problem will be if this recipe isn’t going to be quite how I need it to be for the wedding cake then I would need to try another recipe from elsewhere. It will need to hold well given the wedding cake is going to be three tiered with four layers per tier. I’m reading comments that the cake turns out dense for some so it might work but need to ensure it’s not crumbly either. The test will be tonight when it’s made. I’ll post results. Stay tuned. I have just tried it, it is too dense, and the texture is ok but the inside colour after cooking turned into brownish , please help what is the cause, is it baking soda? Sorry to hear that Upendo. Sounds like too much baking soda or that baking soda was not activated. This is not a dense cake as you can see in the pictures below it’s really light and fluffy. The baking soda gives it that volume. I will be making a video for this soon.I hope that will help. Wow. That is a lot of servings. I have not tested this recipe with that many servings. Not sure what you mean by – if each person gets 200 grams. The recipe card below has a serving conversion – this recipe is for 8 servings if you change that number 8 to 700 servings – it will convert the recipe for you. For example, an 8- inch pan takes about 30 to 40 minutes – a 10-inch pan will take about 40 to 50 minutes and so on. Made this recipe twice and we loved it. Once I made it just with vanilla flavor for tea and the second time I added crushed strawberry and cream in the middle. Both winners. Thank you for sharing mam. Thank you so much, Livali. So happy to hear you had success with this recipe twice and loved it so much. Strawberry and cream is my favorite too. Thanks so much for coming back to write this feedback. Have a wonderful week. Tried this recipe and we loved it. Made it for a few friends and they asked for your blog name too. Thanks for sharing. Thank you so much, Agness. So happy to hear you had success with this recipe and loved it so much. Thanks so much for coming back to write this feedback and sharing my blog with your friends. Have a wonderful week. I have not made it in a 12 inch pan yet. Also, this is not a tall cake – and I made only one layer which I divided into two. That’s just about 2 inches tall. So I’m thinking if you need an 8 inch round that’s 4 inch tall you will need to double that recipe. Then multiply by 3 to get a 12-inch cake. Would it be okay if I used a vegan yogurt? I’m not sure Katie. I think someone did perhaps check in the comments. I have not tried it so not sure yet. Tried this cake with exact same measurements. I however replaced yogurt with buttermilk. It is the best eggless cake i have ever made. No soggy centers, beautiful texture and taste. I wish I could paste a photo of my cake here but there doesn’t seem to have an option fr that here. Are the measurements for 1kg cake or half kg?? I tried this today but it While slicing and assembling it was falling apart. Using full 1cup warm l milk is necessary or we have to use as much as required for dropping consistency batter? My batter I felt was too much liquidy. Hey Sri. That does not make sense. If you see the images in my post. My batter is not liquidy. In fact, I baked it in removal bottom pan too. So my batter is definitely not liquid. Did you use all the flour mentioned? Yes, I did use full 2 cups. I went through the recipe again. I did two mistakes, I mixed sugar with dry ingredients instead of wet and my curd was little cold and not room temp. I shall try this recipe again once. Thank you. Ah!! sorry to hear that.. Did you bake it? How was it? Sounds like it must have taken forever to bake too. Sorry, this happened. Yeah baking can be unforgiving when it comes to measurements. Tried this cake today… It was easy to make, rose evenly and had a good moist texture. But I felt was a bit lacking in taste when eaten plain. Maybe added flavour or icing/filling would help. Ramya. That’s strange because most people love eating it on its own. And the general feedback I get that it is delicious on its own. I do often add frosting but love this one myself on its own. Flavors, fillings and frostings are always a great addition but it also depends on what your preference is. This is already a small recipe Rashmi. I have not tried making half. I have doubled it and works well. I hate to make sheet cake. Will 8″ square/9″ round pans make difference in cooking time? Will try this and see how it turns out. Hey Alice. Sounds like your oven is too hot. Try using an oven thermometer to check your actual oven temperature. Sometimes calibrating the oven helps. Thank you so much Madhu. Welcome back. Hi Veena, I tried this cake today and it turned out beautiful. I baked with exact same ingredients from your recipe. The texture is really good without eggs. My only concern here is if the oil can be replaced with butter or clarified butter. My family liked it but they can taste oil in it. Piryanka I have not tried it with butter or ghee. You can try and let me know. If you use good quality vanilla and oil you should have any oil taste at all. Compared to butter, oil often makes for a much lighter and moist cake. 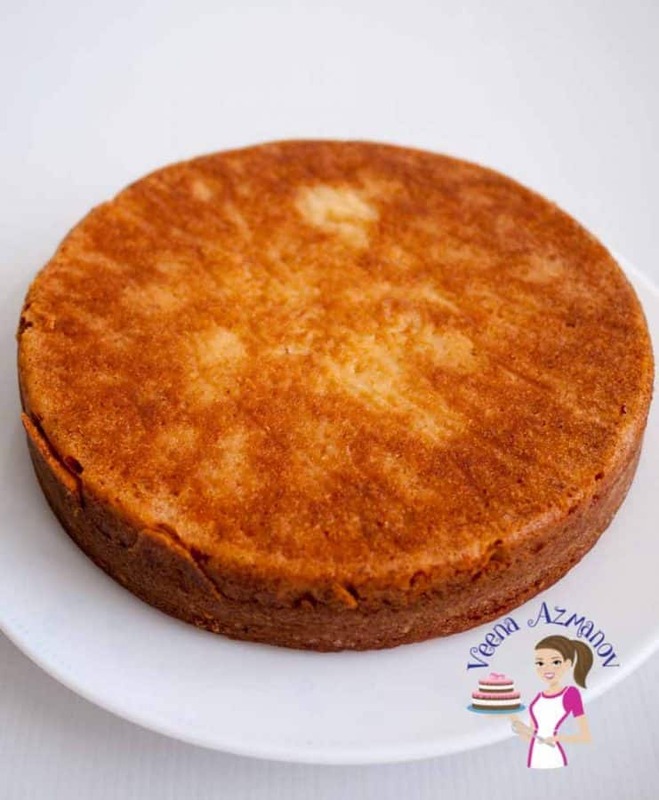 This is one of the best eggless cakes I’ve tried till now,every week there is a demand to bake it, everyone loved it…thankyou Veena for sharing the recipe ? Thank you so much Somali. So happy to hear you had great success with this recipe and that your family enjoyed it so much… thanks for coming back to write this feedback. Tried this recipe yesterday and it turned out perfect. We ate it just warm without any filling or frosting. Best eggless cake I ever made. Thank you for this recipe. I tried to make this cake 3 times and it did not work out at all – dense and undercooked in the middle. The outside was crispy (overcooked). So disappointed since my daughter has an egg allergy. Even more disappointed that I was bound and determined to make it work and wasted so much time and ingredients. I followed the recipe exactly. I wish I had read the comments before making this because it seems that this recipe has received mixed reviews. Hi Amanda, Sorry the cake did not turn out well for you. I have been using this one for a white now so not sure why three of you have had issues recently. There a also some who have tried this recipe successfully. Hi Veena, thank you for your wonderful blog! I have a question about this recipe. Are the portions for one 8” pan or two? I wasn’t sure! Thank you! Jahnavi I make only one single layer with this. You can double the recipe successfully. Hi veena, i tried this recipe today. Mine didn’t turn out as nice as yours tho. The sides where overbaked, yet the very bottom was raw. Oven temp was 340 and baked for 45min. Maybe i will lower the oven temp next time. Also, if i make cupcakes out of this, what should the oven temp and time be? I followed the recipe exactly how it was. But it took more than 40 mins to bake. And still not cooked properly. I dont know why. That is weird Yogeeta. Is your oven working to the right temperature? Did this happen only with this cake or other cakes too! I make it often and others have tried this too. Should I use natural yougurt (greek style) or any sweetened vanilla yogurt. Natural yogurt is a bit tangy Im concerned if that will effect the cake ? Could you please confirm if yogurt and curd are one and the same. There are many different types of curds!! But yogurt is milk yogurt. Thick, creamy and a bit tangy. Hi. I tried this cake but it turned brown inside and had metallic taste. What do I do to fix it? I don’t understand – sounds like you have extra leveling agent. Did you add the baking soda twice? How long did you bake it? Read the ingredients and see if there is anything that you did different. I’ve done this a few times and it’s never been brown or metallic. I baked it for about 35 minutes. 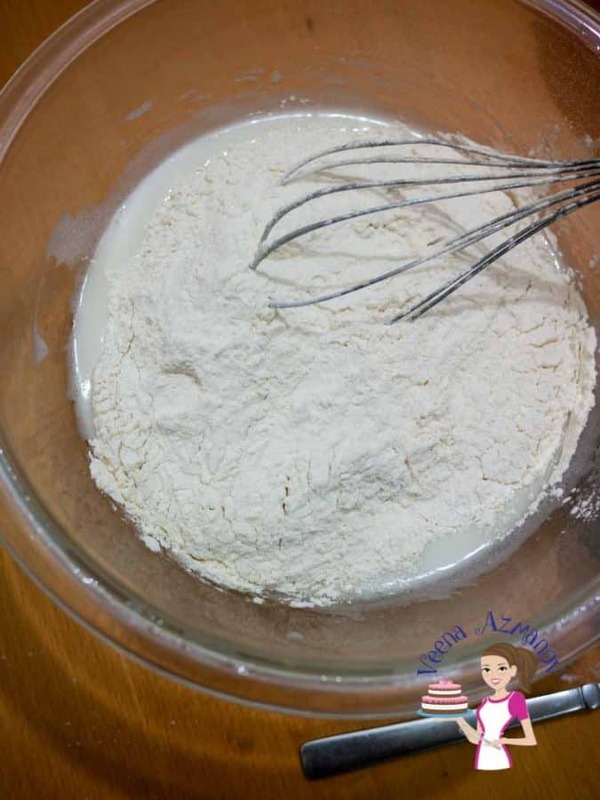 Can I substitute the baking soda with just the baking powder or could I lower the baking soda. The metallic taste is usually caused by the baking soda. 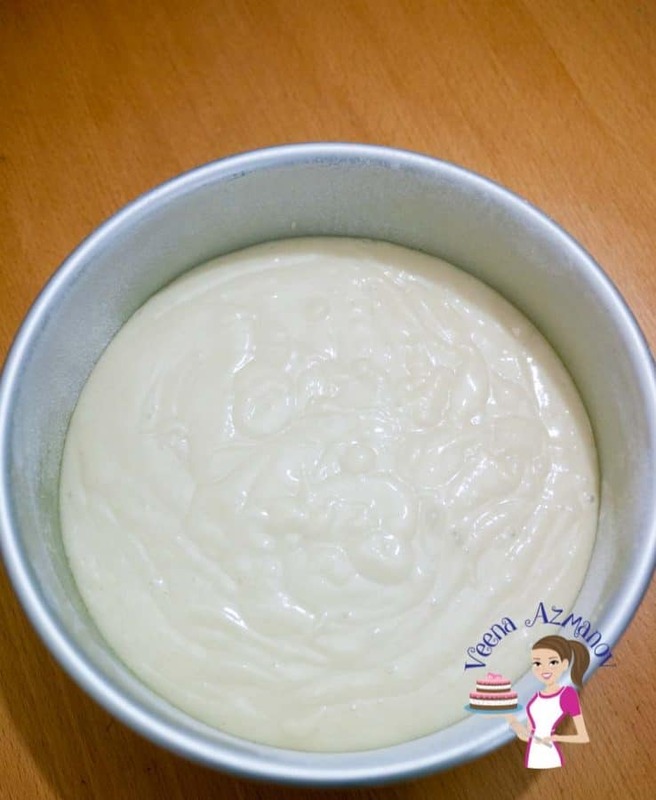 I always fail making a eggless white cake ?. Also I suppose took a 9 inch pan. Would it make it any difference? Thank you so much again for your valuable time. No that pan would only effect the thickness of the cake. 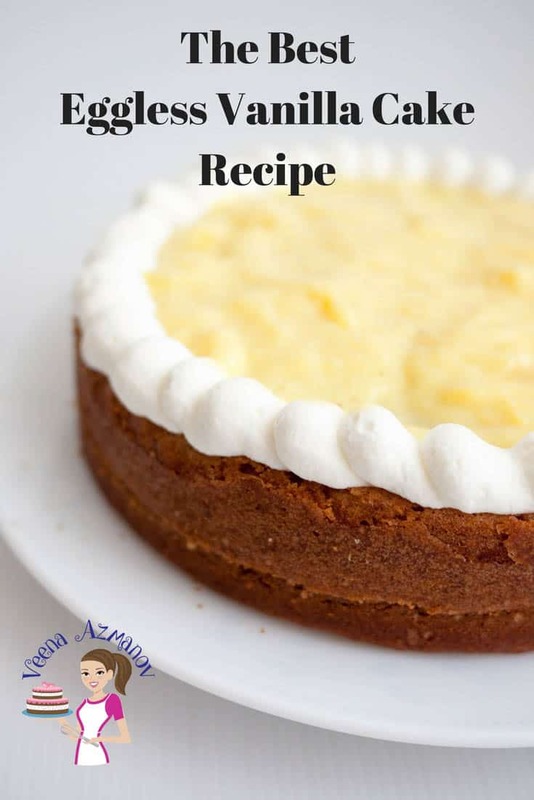 Yes you can add 1/2 tsp less baking soda but i have done this cake with this recipes and it works for me every single time. If you read the comments some people have tired it and have loved it. So not sure what’s happening at your end. The cling film is just a plastic that stop a skin forming on top of the pastry cream. You can use any plastic even a sandwich bag instead. Hi veena, 220 grams is 1 cup or 2 cups of flour? One cup is 110 grams – so 2 cups is 220 grams? no? I had a similar question. For some reason I though 1 cup of flour is 120 g. I live in the US. Could that be the reason for the difference? Thank you so much Jagruti for your feedback. I am so happy to hear that it turned out perfect. Love that your son enjoyed it too. I have not tried making this one with butter but I highly recommend you keep the oil. It keeps the cake moist and light. 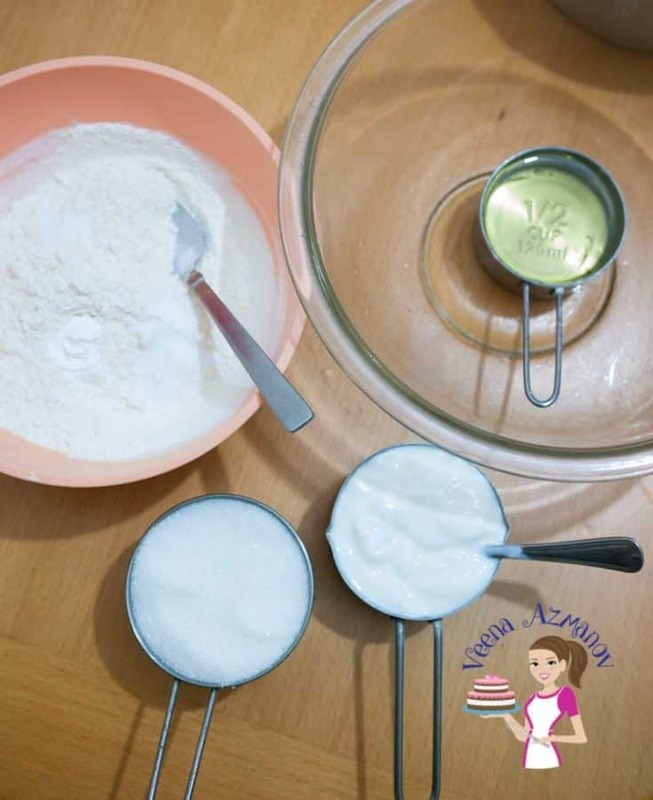 I do have a butter based eggless cake recipe which I plan to share here on the blog. Hopefully soon. I love everything about this recipe!! It looks and sounds amazing and I love your video! The texture of the cake looks exactly how you describe it! I’m printing this recipe off now! Thank you Amanda – Happy to hear that. Excited to try this! I have a nephew with an egg allergy. Thanks for sharing! Always a pleasure Lynette. We have no alergies but we still make it often. I still haven’t tried an eggless cake, but this looks so fluffy and high that I must make one. 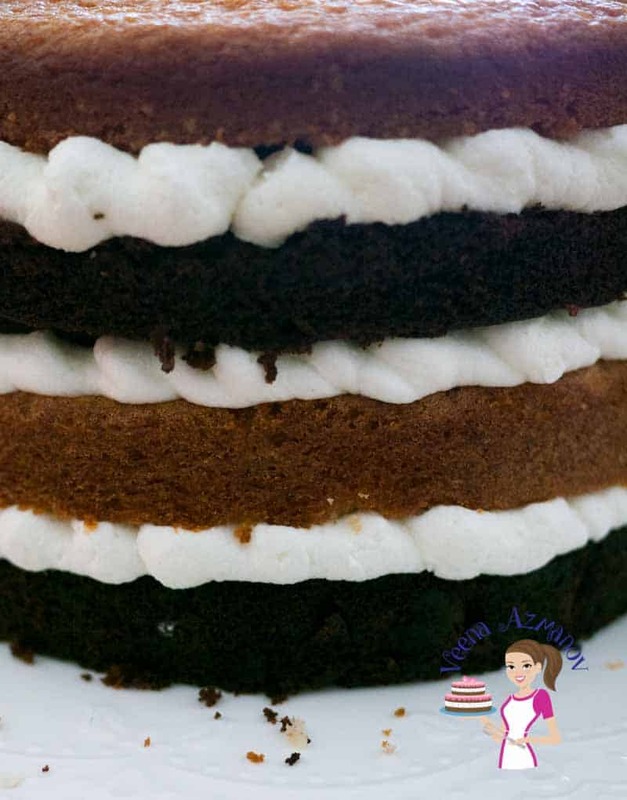 I’ve never made an eggless cake – this sounds wonderful so I’m going to have to give it a try! What a lovely recipe! Perfect for when you need an egg free treat! Thank you for showing us the inside of the cake, it looks so moist and with a beautiful crumb! 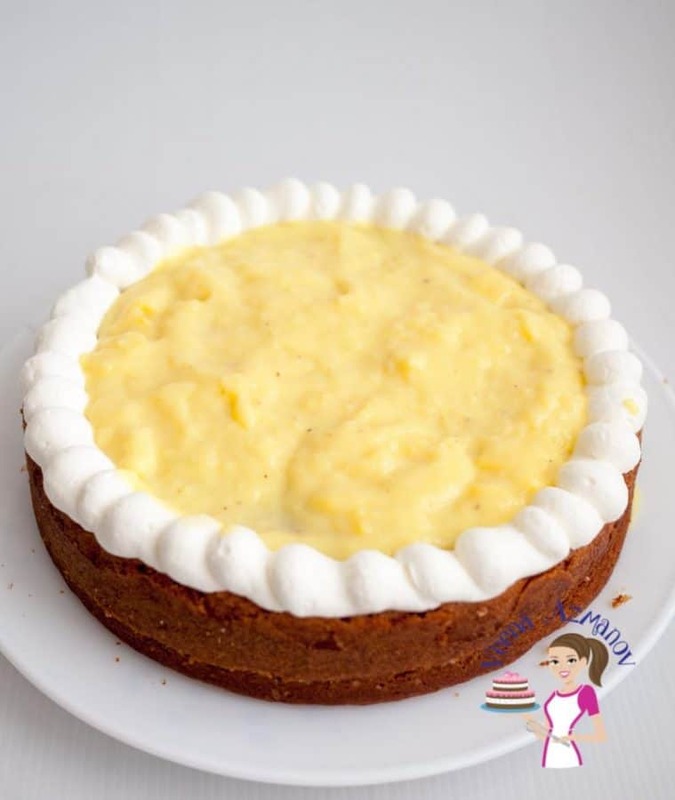 I happen to love baking with yogurt, and oil, so I am sure I will love your eggless vanilla cake! Thank you Nicoletta. I love how light and airy this cake is and the only way to show it would be to show the inside. What a beautiful cake! I can’t wait for an excuse to try it! Honestly I never made a cake without eggs. Always wondered how yougurt could replace it? Will sour cream work too in your opinion ? Thank you Tatiana. 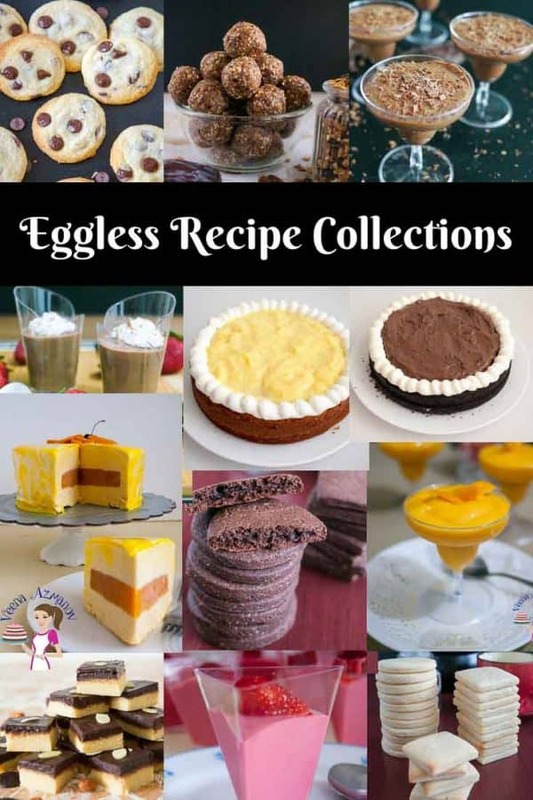 Many customers can’t eat eggs now a days so have to have some good eggless recipes on hand. Not sure about sour cream. I think it should but have not tried it yet. The cake looks and sounds delicious, but I am ALL OVER that pastry cream! Than you Dominique. Yup! This cake does have a good texture. That is why I decided to show the inside. I really love how soft and light this cake turns out. This cake looks fabulous! The crumb is perfect! I haven’t made many no egg cakes but I definitely want to try your recipe! Thank you Elaine – Let me know the outcome. My grandson happens to love vanilla cake. This would make the perfect birthday cake for him. I will have to try this out next time I need to decorate a cake. This is a lovely recipe, thank you Veena. This recipe was so easy to make vegan as it already is egg-free. I simply used coconut yoghurt and plant based milk in place of the dairy option. I used coconut milk, but soy or other plant based milks would also work I think. I baked it in 2 x 6″ round tins and filled and decorated with vegan buttercream. It was delicious! Tried the eggless vanilla cake and it was beyond amazing! Thanks Veena Azmanov for sharing the recipe. Thank you so much Swapna for your feedback. Really happy to hear you enjoyed it. It really is so easy isn’t it?